The Power of Appreciation - BlogIT with OLIVIA!!! The only thing that gets mum so riled up where dad is, is usually his inability to appreciate her overwhelming efforts to run the family. 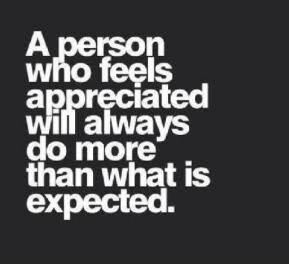 He does sometimes but showing appreciation is what one should do always. Mum is a genius when it comes to tolerance. Whatever will upset her is usually deep rooted, it means whoever made her angry really ovrover stepover stepped. Easy anger is not her thing. And trust me, she married an egocentric man whose watchword is PATRIARCHY. Remember I said Dad loves been in control? He loves that just as he loves to breathe. He can storm out of the house just because of little issues that isn't worth it. He can turn the house upside down just to have it his ways, its that bad but do you have an idea what can quiet him down?? Need I say what tool Mum uses on him??? Its APPRECIATION. "Honey, I'm very grateful, Dan's school fees was received", a proud mum would see it as him having done his duty by paying his son's school fees but Mum doesn't see it that way hence the appreciation. And trust me, that's what has been keeping th family together. Me: Are you here for the holiday classes I talked about? You want me to put your name down?? Couldnt recognise them. Mr Love, a friend that helped me before I was posted to my place of primary assignment felt I neglected him. Things happened very fast and maybe I didn't show enough appreciation and him, been the person he is, failed to understand my reasons and resorted to having grudges. It was bad that he visited my friend, passed my door without ss much as saying hi to me. That aside, there were so many other things that transpired which I can't really put down here, but I believed if I had showed enough appreciation, there wouldn't be room for unnecessary quarrel. appreciated. It is a gnawing and unfaltering human hunger and the rare individual who honestly satisfies this heart hunger will hold people in the palm of his or her hand. Naturally, human beings desire for a feel of importance. People sometimes become invalids in order to win sympathy and attention and get a feeling of importance.
" There is nothing anyone would crave for as much as nourishment for their self-esteem. We nourish the bodies of our children, friends, spouses and employees but how seldom do we nourish their self- esteem?" ...Carnegie. Appreciation and what do average people do? They truly regard it as nothing. They overlook its importance in life. If they don't like anything, they will bawl out their distaste but when they eventually like it? They'd say nothing. Absolutely nothing forgetting that a man can only work harder for greater things when he's been appreciated for the little work he performed. Research showed that most runaway wives did so because of lack of appreciation from their husbands and if similar research is been carried out , the case would still be same. Husbands thinking separation because their wives aren't grateful. that won't love to be appreciated for the little thing he did. Your wife?? Pat her on the back, honey that meal was wonderful and nice. Your husband?? Sweetie, thank you so much for doing the dishes, you've really displayed a wonderful talent. Your employee?? Oops, you shouldn't have done it this way but wow, that effort you geared was quite encouraging, you've really got some skills. Your kids?? Sugar pie, your result is awesome...and you can do much better next time. Just a little harder sweetie. Just try leaving a little spark of gratitude on your daily steps.